A collection of essays, articles and interviews chronicling the decline of St.Pauli and it's fan culture. 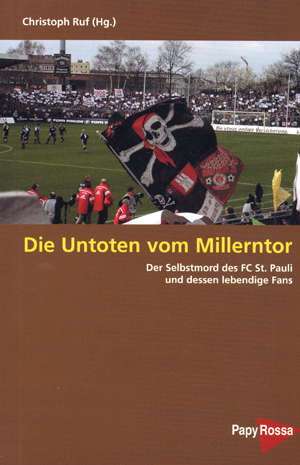 Ruf actually writes about 2/3 of the book, as he chronicles the problems with St.Pauli starting with the relegation from the Bundesliga in 2002. Given that it's entitled "On a Highway to Hell - Der aufhaltsame Abstieg", you get a pretty good idea of it's contents. One of the chief villians is the Club Business Manager, Stephen Beutel. "Without Stephen Beutel, many of the talented players developed at St.Pauli over the last 15 years would still be playing for the club, or brought in so much money in transfers that the club could invest in the future." There are a few guest writers, who bring out their personal connections with SP, along with a few interviews. In general, the ones with the ex-players or coaches are the most interesting. There is no mention of the older tradition of the club, the original fans. Perhaps this is because this book is really about the most recent crisis in the club. Some of fan change is touched on, ironically, from the article of a (relatively recent) fan. He wonders whether the oldtimers are resentful if the aura surrounding the club has become less about football and more about partying and politics.